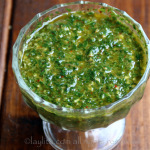 Quick chimichurri sauce made with parsley, oregano, basil, garlic, oil, white wine vinegar, and chili powder. Combine all of the ingredients in the blender (or mini food processor), mix until you have a smooth sauce. For a more rustic chimichurri, blend all the ingredients except the oil and then stir it in at the end. Taste and adjust salt/pepper or chili powder as needed. You can also adjust the amount of vinegar based on the acidity level that you prefer. Refrigerate until ready to use (but should be used the same day).